The Hamilton Tiger-Cats could still be without starting quarterback Zach Collaros when next season begins. Collaros, who suffered a season-ending knee injury last September, was still on crutches Tuesday as players cleaned out their lockers at Tim Hortons Field. He wasn't sure whether he'll be ready to go when the new campaign begins in June. "I'm not sure of a timeline to be honest with you," Collaros said. "I'd like to be back as soon as possible. At the same time, I'm not going to rush and get hurt again. I'm going to do everything that I can and work as hard as I can to be back as soon as possible." 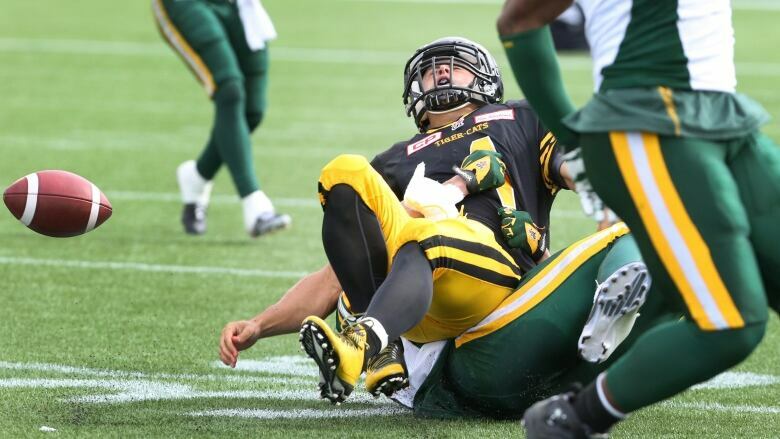 Collaros tore the anterior cruciate ligament in his right knee after taking a hit in the second quarter of a Sept. 19 game against Edmonton. Both he and head coach Kent Austin said they would take the advice of medical professionals, with Austin adding that he didn't want his star pivot to rush back into action. "We're going to be smart and we're going to go according to the people that are the most knowledgeable and make sure that we keep him on track," said Austin. "He's a valuable asset for us and we're not going to push him back too early." Collaros, a 27-year-old native of Steubenville, Ohio, will be staying in southern Ontario to do his rehab. At the time of his injury, Hamilton led the CFL East Division standings with an 8-3 record and seemed unstoppable. The Ticats lost to the Eskimos and backup pivot Jeff Mathews went 2-3 as a replacement before suffering a concussion in a game against Ottawa. Mathews was replaced by Jacory Harris for the final regular-season game — also against the Redblacks — but Jeremiah Masoli took over later in the contest. Hamilton lost both games and settled for a second-place finish at 10-8. Masoli, who was on the practice roster earlier in the season, led the Ticats to an Eastern semifinal victory over the Toronto Argonauts and almost pulled off a victory against Ottawa in the East final. Collaros, meanwhile, still finished fourth overall among CFL pivots with 3,376 passing yards despite missing six-and-a-half games. He completed 252 of 359 pass attempts (70.2 per cent) for 25 touchdowns, eight interceptions and a league-leading quarterback rating of 113.7. Over 30 Ticats could become free agents this February, including high-profile players like kicker Justin Medlock, lineman Ted Laurent and wide receivers Andy Fantuz and Bakari Grant. Masoli, a pleasant surprise after surfacing from fourth on the QB depth chart, could also become a free agent. The questionable status of Collaros makes the 27-year-old San Francisco native an intriguing option. Masoli has been with Hamilton for three years and said he loves the Ticats' organization. "We're going to negotiate to have him back and we'll see how that goes," said Austin. "But we feel good about the group (of quarterbacks on the roster) and we'll be ready to play next football season."